Keeping a log home or a log cabin in great condition is hard work and time-consuming. Why complete the upkeep of your log home on your own? It is always best to work as a team, and our team at 888-LOG-GUYS wants to work with you to make sure your log home or log cabin is fixed, restored, rejuvenated, maintained, or improved upon. We are currently serving the Lake Barkley Kentucky area, and we are wanting to hear from you! Call us with your questions, concerns, ideas, or send us a request for a free quote from our website! 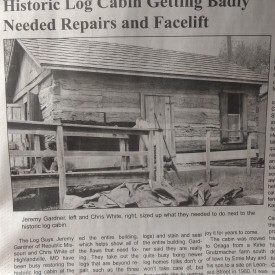 Do you not quite know if your log home or log cabin needs to be restored? Ask the best in the log home restoration business, 888-LOG-GUYS! Our staff is knowledgeable in log home restoration and can give you the best solution for your log home! Our full process includes media blasting (with sand, glass, walnut, or corn cob), sanding, cleaning (with a borate treatment), chinking or caulking, and staining. We offer flexible and affordable price packages that will work for your budget! Give us a call or ask for a quote from our website! If you see log damage from rot or holes from insects or birds, don’t worry or stress! Our professional staff and experienced crew at 888-LOG-GUYS is ready to fix your log home in the Lake Barkley KY area, no matter what kind damage it may have. 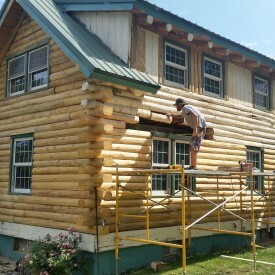 We have repaired or replaced many feet of logs to bring several log homes back to its original high quality. Call us or request an estimate from our website. We will explain to you exactly what needs to be done at a minimal cost. If you have water leaks, then stop them! If you have air drafts, block them! If you have invading insects, then keep them out! 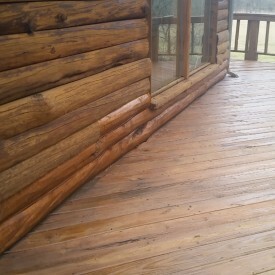 Seal your log home and fill in those gaps in between your logs with an energy seal, chinking, or caulking. Make sure you ask 888-LOG-GUYS to do the job for you! With our knowledge and experience, we know how to properly apply an energy seal to your log home to keep your home secure and comfortable. Our crew can work for you in your Lake Barkley KY area, so please give us a call or request an estimate online! Are you thinking about how you would like to change or improve your log home? 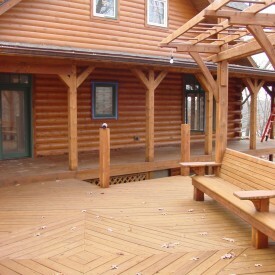 Can you picture a new deck or porch for your log home? Can you see a grand log staircase ascending up to a loft? Can you imagine a new log railing to beautify your log home or log cabin? Of course, you can imagine that! 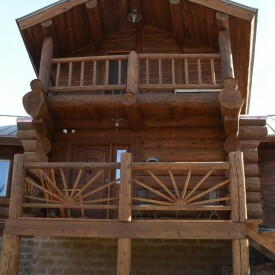 Let 888-LOG-GUYS construct what you dream for your log home! We have the best in the log home improvement business to build what you like! 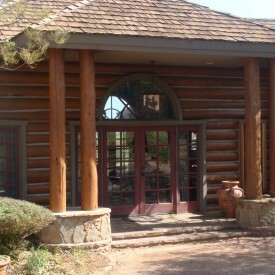 Did 888-LOG-GUYS restore your log home or is your log home already in excellent condition? That is awesome! Congratulations! But keep us in mind to maintain your log home. We would love to continue your log home care. We know what it takes to upkeep your home and maintain its health and beauty. Call 888-LOG-GUYS today for a free quote or request one from our website! 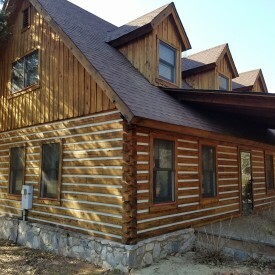 We will be there to ensure your log home in the Lake Barkley KY area has the best service in log home maintenance.